The worst thing happened... it was a saturday morning, there I was, looking forward to my weekend morning oatmeal... and there was no milk. And you know, I did what was predicted of a religious oatmeal lover...I has a hypothetical panic attack. Coz you know, no weekend is ever complete without oatmeal. Amirite? So, this happened. Behold, the creamiest, most comforting non-milk oatmeal. I'd even go to the extent of saying that is was just as creamy as porridge WITH milk. Would definitely recommend you try this recipe! Enjoy! 1. 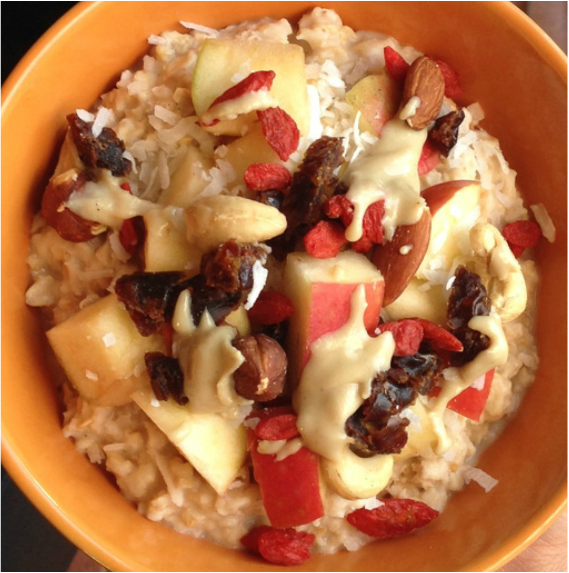 Place oats, coconut flakes, and cinnamon in a bowl and mix ingredients. 2. In another bowl, stir a cup of water, vanilla bean paste and tahini. 3. Mix all ingredients together until it is well combined. 4. Place oats in a microwave for 2 minutes, then stir and add about two tablespoons extra of water and place in microwave for another 30 seconds. (Or you can use cook the oatmeal on the stove top instead of the microwave) - If the porridge becomes dry, just add more water. Tip: Because the oatmeal is very creamy, I definitely suggest loading it up with lots of toppings like-fruit (apple, banana, pear, dates etc), chia seeds, raw nuts, almond butter, dark chocolate- the options are endless!